CONFESSIONS OF A PAPARAZZI etc: Gwen Stefani's Homage to Madonna? (I am pulling a Perez and lifting someone else's photos. I would give them credit, but they were on other peoples blogs. I will take them down if requested) This has to be said, I hated Madonna's hair stylist when I thought she did this do, and so did many other style conscious people. 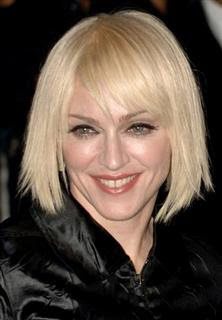 WHY then didn't Gwen listen to the hoardes who were shocked and not in a good way to the Madonna hair change. I always thought Gwen was going to blaze her own trail and not imitate Madonna, especially because they already looked so similar. I have to say this haircut and the Yodel song have forced me towards ITUNES instead of buying the CD. I just can't bear accidently listening to the Yodel song anytime soon. I hope she doesn't do it as an encore in her concert, it's not the last song of the night I would want to hear after a GWEN concert! Didn't this poster shock Gwen back to reality. GWEN WAKE UP, the blunt haircut is not flattering on you! Is this her homage to Madonna? This look will no doubt create many magazines to do a "Gwen's Hairstyles through the ages" montage. I guess its rather a clever PR idea. I've certainly done something out of the norm just so I can write about the distaste of the 'do! What do you think about Gwen's new look? A ton of people are complaining about her hairdo. I heard Gwen is going bald though. Going bald??? Due to years and years of overprocessing, dying etcetera. Makes me wonder 'bout Nicole Richie's natural do. Call me stupid, but i see these young kids with so many different styles, short, long, blond, dark , that i wonder what do they have underneath it all. I had read that the look she was consciously going for was that of Michelle Pfeiffer's coke-addicted gangster's wife Elvira in "Scarface" (1983). Les jeux de machines a sous en ligne sont les jeux de casino les plus populaires dans un casino en ligne cascade plusieurs raisons. Une des principales raisons est qu'il y a une grande variete de machines a sous.